Masters of horror, Full Moon have begun unleashing their Bunker of Blood project on both Amazon and their own streaming service. The series is an 8 part feature film series that brings back some of their earlier releases as a greatest hits package of sick and twisted goodness with cut scenes and best of moments repackaged as an awesome overview. The new re-release of their classics in this brand new format is set to shock and scare fans of the genre. First up on their docket of gore is Puppet Master:Blitzkrieg Massacre, which takes bits from all 11 released movies and will showcase highlights from the entire series. Starting today, September 25th, this Puppet Master mix-up is now available. When all 8 DVDs are eventually purchased, the spines of the cases will reveal a secret mural painting. HOLLYWOOD, September 25, 2018 – Full Moon’s BUNKER OF BLOOD is an 8-part feature film series designed to shock and scare. Drawing from nearly three decades of cinematic splatter and freakish film making, BUNKER OF BLOOD is a gory "Greatest Hits" of the legendary studio's strangest and sickest sequences framed by an all new, outrageous narrative. Using lavish illustrated comic book panels to tell the twisted tale of the masochistic drifter and the mad "guru of gore," the series will drive viewers deep into the dark, dank depths of a madman's macabre lair. 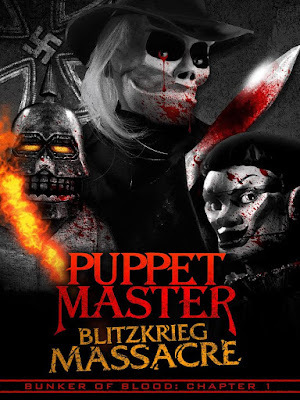 This stomach-churning adventure starts off with PUPPET MASTER: BLITZKRIEG MASSACRE, in which The Gore Collector culls the sickest moments from the 11-film deep PUPPET MASTER series, mashing them together with macabre music and brand new moments of body-breaking mayhem.